Aircraft structural members are designed to perform a specific function or to serve a definite purpose. The primary objective of aircraft repair is to restore damaged parts to their original condition. Very often, replacement is the only way this can be done effectively. When repair of a damaged part is possible, first study the part carefully to fully understand its purpose or function. Strength may be the principal requirement in the repair of certain structures, while others may need entirely different qualities. For example, fuel tanks and floats must be protected against leakage; cowlings, fairings, and similar parts must have such properties as neat appearance, streamlined shape, and accessibility. The function of any damaged part must be carefully determined to ensure the repair meets the requirements. An inspection of the damage and accurate estimate of the type of repair required are the most important steps in repairing structural damage. The inspection includes an estimate of the best type and shape of repair patch to use; the type, size, and number of rivets needed; and the strength, thickness, and kind of material required to make the repaired member no heavier (or only slightly heavier) and just as strong as the original. When investigating damage to an aircraft, it is necessary to make an extensive inspection of the structure. When any component or group of components has been damaged, it is essential that both the damaged members and the attaching structure be investigated, since the damaging force may have been transmitted over a large area, sometimes quite remote from the point of original damage. Wrinkled skin, elongated or damaged bolt or rivet holes, or distortion of members usually appears in the immediate area of such damage, and any one of these conditions calls for a close inspection of the adjacent area. Check all skin, dents, and wrinkles for any cracks or abrasions. Nondestructive inspection methods (NDI) are used as required when inspecting damage. NDI methods serve as tools of prevention that allow defects to be detected before they develop into serious or hazardous failures. A trained and experienced technician can detect flaws or defects with a high degree of accuracy and reliability. Some of the defects found by NDI include corrosion, pitting, heat/stress cracks, and discontinuity of metals. Remove all dirt, grease, and paint from the damaged and surrounding areas to determine the exact condition of each rivet, bolt, and weld. Inspect skin for wrinkles throughout a large area. Check the operation of all movable parts in the area. Determine if repair would be the best procedure. Certain fundamental rules must be observed if the original strength of the structure is to be maintained. Ensure that the cross-sectional area of a splice or patch is at least equal to or greater than that of the damaged part. Avoid abrupt changes in cross-sectional area. Eliminate dangerous stress concentration by tapering splices. To reduce the possibility of cracks starting from the corners of cutouts, try to make cutouts either circular or oval in shape. Where it is necessary to use a rectangular cutout, make the radius of curvature at each corner no smaller than 1⁄2-inch. If the member is subjected to compression or bending loads, the patch should be placed on the outside of the member to obtain a higher resistance to such loads. If the patch cannot be placed there, material one gauge thicker than the original shall be used for the repair. Replace buckled or bent members or reinforce them by attaching a splice over the affected area. A buckled part of the structure shall not be depended upon to carry its load again, no matter how well the part may be strengthened. The material used in all replacements or reinforcements must be similar to that used in the original structure. If an alloy weaker than the original must be substituted for it, a heavier thickness must be used to give equivalent cross-sectional strength. A material that is stronger, but thinner, cannot be substituted for the original because one material can have greater tensile strength but less compressive strength than another, or vice versa. Also, the buckling and torsional strength of many sheet metal and tubular parts depends primarily on the thickness of the material rather than its allowable compressive and shear strengths. The manufacturer’s SRM often indicates what material can be used as a substitution and how much thicker the material needs to be. Figure 1 is an example of a substitution table found in an SRM. Care must be taken when forming. Heat-treated and coldworked aluminum alloys stand very little bending without cracking. On the other hand, soft alloys are easily formed, but they are not strong enough for primary structure. Strong alloys can be formed in their annealed (heated and allowed to cool slowly) condition, and heat treated before assembling to develop their strength. The size of rivets for any repair can be determined by referring to the rivets used by the manufacturer in the next parallel rivet row inboard on the wing or forward on the fuselage. Another method of determining the size of rivets to be used is to multiply the thickness of the skin by three and use the next larger size rivet corresponding to that figure. For example, if the skin thickness is 0.040-inch, multiply 0.040-inch by 3, which equals 0.120-inch; use the next larger size rivet, 1⁄8-inch (0.125-inch). 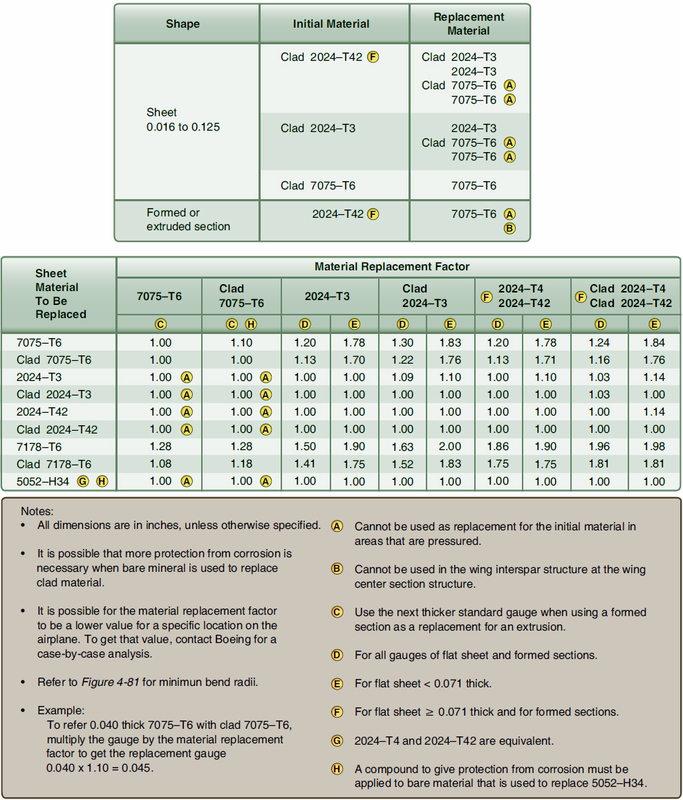 The number of rivets to be used for a repair can be found in tables in manufacturer’s SRMs or in Advisory Circular (AC) 43.13-1 (as revised), Acceptable Methods, Techniques, and Practices—Aircraft Inspection and Repair. 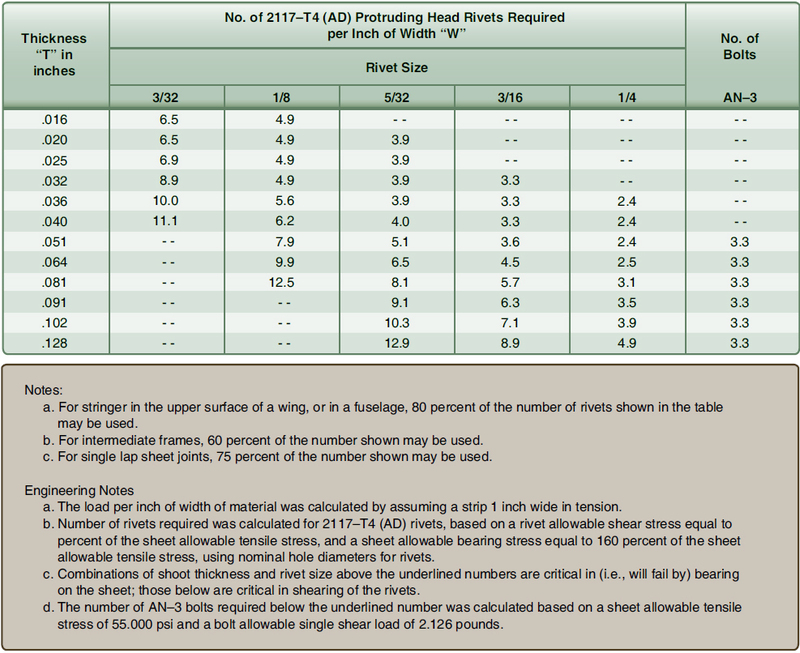 Figure 2 is a table from AC 43.13-1 that is used to calculate the number of rivets required for a repair. Extensive repairs that are made too strong can be as undesirable as repairs weaker than the original structure. All aircraft structure must flex slightly to withstand the forces imposed during takeoff, flight, and landing. If a repaired area is too strong, excessive flexing occurs at the edge of the completed repair, causing acceleration of metal fatigue. Aircraft structural joint design involves an attempt to find the optimum strength relationship between being critical in shear and critical in bearing. These are determined by the failure mode affecting the joint. The joint is critical in shear if less than the optimum number of fasteners of a given size are installed. This means that the rivets will fail, and not the sheet, if the joint fails. The joint is critical in bearing if more than the optimum number of fasteners of a given size are installed; the material may crack and tear between holes, or fastener holes may distort and stretch while the fasteners remain intact. Form all repairs in such a manner to fit the original contour perfectly. A smooth contour is especially desirable when making patches on the smooth external skin of highspeed aircraft. Keep the weight of all repairs to a minimum. Make the size of the patches as small as practicable and use no more rivets than are necessary. In many cases, repairs disturb the original balance of the structure. The addition of excessive weight in each repair may unbalance the aircraft, requiring adjustment of the trim-and-balance tabs. In areas such as the spinner on the propeller, a repair requires application of balancing patches in order to maintain a perfect balance of the propeller. When flight controls are repaired and weight is added, it is very important to perform a balancing check to determine if the flight control is still within its balance limitations. Failure to do so could result in flight control flutter. To prevent severe vibration or flutter of flight control surfaces during flight, precautions must be taken to stay within the design balance limitations when performing maintenance or repair. The importance of retaining the proper balance and rigidity of aircraft control surfaces cannot be overemphasized. The effect of repair or weight change on the balance and CG is proportionately greater on lighter surfaces than on the older heavier designs. As a general rule, repair the control surface in such a manner that the weight distribution is not affected in any way, in order to preclude the occurrence of flutter of the control surface in flight. Under certain conditions, counterbalance weight is added forward of the hinge line to maintain balance. Add or remove balance weights only when necessary in accordance with the manufacturer’s instructions. Flight testing must be accomplished to ensure flutter is not a problem. 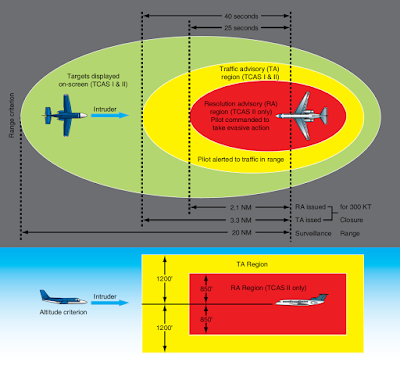 Failure to check and retain control surface balance within the original or maximum allowable value could result in a serious flight hazard. Aircraft manufacturers use different repair techniques and repairs designed and approved for one type of aircraft are not automatically approved for other types of aircraft. When repairing a damaged component or part, consult the applicable section of the manufacturer’s SRM for the aircraft. Usually the SRM contains an illustration for a similar repair along with a list of the types of material, rivets and rivet spacing, and the methods and procedures to be used. Any additional knowledge needed to make a repair is also detailed. If the necessary information is not found in the SRM, attempt to find a similar repair or assembly installed by the manufacturer of the aircraft. When visually inspecting damage, remember that there may be other kinds of damage than that caused by impact from foreign objects or collision. A rough landing may overload one of the landing gear, causing it to become sprung; this would be classified as load damage. During inspection and sizing up of the repair job, consider how far the damage caused by the sprung shock strut extends to supporting structural members. A shock occurring at one end of a member is transmitted throughout its length; therefore, closely inspect all rivets, bolts, and attaching structures along the complete member for any evidence of damage. Make a close examination for rivets that have partially failed and for holes that have been elongated. Whether specific damage is suspected or not, an aircraft structure must occasionally be inspected for structural integrity. The following paragraphs provide general guidelines for this inspection. When inspecting the structure of an aircraft, it is very important to watch for evidence of corrosion on the inside. This is most likely to occur in pockets and corners where moisture and salt spray may accumulate; therefore, drain holes must always be kept clean. While an injury to the skin covering caused by impact with an object is plainly evident, a defect, such as distortion or failure of the substructure, may not be apparent until some evidence develops on the surface, such as canted, buckled or wrinkled covering, and loose rivets or working rivets. A working rivet is one that has movement under structural stress, but has not loosened to the extent that movement can be observed. This situation can sometimes be noted by a dark, greasy residue or deterioration of paint and primers around rivet heads. External indications of internal injury must be watched for and correctly interpreted. When found, an investigation of the substructure in the vicinity should be made and corrective action taken. Warped wings are usually indicated by the presence of parallel skin wrinkles running diagonally across the wings and extending over a major area. This condition may develop from unusually violent maneuvers, extremely rough air, or extra hard landings. While there may be no actual rupture of any part of the structure, it may be distorted and weakened. Similar failures may also occur in fuselages. 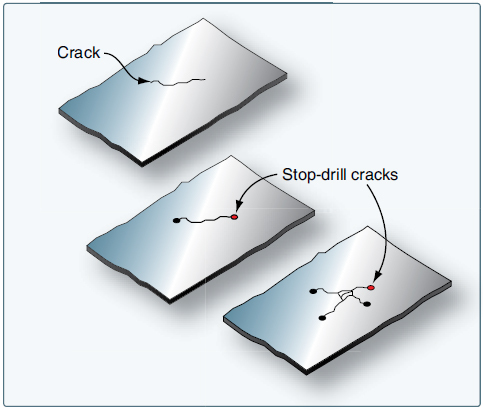 Small cracks in the skin covering may be caused by vibration and they are frequently found leading away from rivets. Aluminum alloy surfaces having chipped protective coating, scratches, or worn spots that expose the surface of the metal should be recoated at once, as corrosion may develop rapidly. The same principle is applied to aluminum clad (Alclad™) surfaces. Scratches, which penetrate the pure aluminum surface layer, permit corrosion to take place in the alloy beneath. A simple visual inspection cannot accurately determine if suspected cracks in major structural members actually exist or the full extent of the visible cracks. Eddy current and ultrasonic inspection techniques are used to find hidden damage. Brinelling—occurrence of shallow, spherical depressions in a surface, usually produced by a part having a small radius in contact with the surface under high load. Burnishing—polishing of one surface by sliding contact with a smooth, harder surface. Usually there is no displacement or removal of metal. Burr—a small, thin section of metal extending beyond a regular surface, usually located at a corner or on the edge of a hole. Corrosion—loss of metal from the surface by chemical or electrochemical action. The corrosion products generally are easily removed by mechanical means. Iron rust is an example of corrosion. Crack—a physical separation of two adjacent portions of metal, evidenced by a fine or thin line across the surface caused by excessive stress at that point. It may extend inward from the surface from a few thousandths of an inch to completely through the section thickness. Cut—loss of metal, usually to an appreciable depth over a relatively long and narrow area, by mechanical means, as would occur with the use of a saw blade, chisel, or sharp-edged stone striking a glancing blow. Dent—indentation in a metal surface produced by an object striking with force. The surface surrounding the indentation is usually slightly upset. Erosion—loss of metal from the surface by mechanical action of foreign objects, such as grit or fine sand. The eroded area is rough and may be lined in the direction in which the foreign material moved relative to the surface. Chattering—breakdown or deterioration of metal surface by vibratory or chattering action. Although chattering may give the general appearance of metal loss or surface cracking, usually, neither has occurred. Galling—breakdown (or build-up) of metal surfaces due to excessive friction between two parts having relative motion. Particles of the softer metal are torn loose and welded to the harder metal. Gouge—groove in, or breakdown of, a metal surface from contact with foreign material under heavy pressure. Usually it indicates metal loss but may be largely the displacement of material. Inclusion—presence of foreign or extraneous material wholly within a portion of metal. Such material is introduced during the manufacture of rod, bar or tubing by rolling or forging. Nick—local break or notch on an edge. Usually it involves the displacement of metal rather than loss. Pitting—sharp, localized breakdown (small, deep cavity) of metal surface, usually with defined edges. Scratch—slight tear or break in metal surface from light, momentary contact by foreign material. Score—deeper (than scratch) tear or break in metal surface from contact under pressure. May show discoloration from temperature produced by friction. Stain—a change in color, locally causing a noticeably different appearance from the surrounding area. Upsetting—a displacement of material beyond the normal contour or surface (a local bulge or bump). Usually it indicates no metal loss. Damages may be grouped into four general classes. In many cases, the availabilities of repair materials and time are the most important factors in determining if a part should be repaired or replaced. Negligible damage consists of visually apparent, surface damage that do not affect the structural integrity of the component involved. Negligible damage may be left as is or may be corrected by a simple procedure without restricting flight. In both cases, some corrective action must be taken to keep the damage from spreading. Negligible or minor damage areas must be inspected frequently to ensure the damage does not spread. Permissible limits for negligible damage vary for different components of different aircraft and should be carefully researched on an individual basis. Failure to ensure that damages within the specified limit of negligible damage may result in insufficient structural strength of the affected support member for critical flight conditions. Damage repairable by patching is any damage exceeding negligible damage limits that can be repaired by installing splice members to bridge the damaged portion of a structural part. The splice members are designed to span the damaged areas and to overlap the existing undamaged surrounding structure. The splice or patch material used in internal riveted and bolted repairs is normally the same type of material as the damaged part, but one gauge heavier. In a patch repair, filler plates of the same gauge and type of material as that in the damaged component may be used for bearing purposes or to return the damaged part to its original contour. Structural fasteners are applied to members and the surrounding structure to restore the original load-carrying characteristics of the damaged area. The use of patching depends on the extent of the damage and the accessibility of the component to be repaired. Damage must be repaired by insertion when the area is too large to be patched or the structure is arranged such that repair members would interfere with structural alignment (e.g., in a hinge or bulkhead). In this type of repair, the damaged portion is removed from the structure and replaced by a member identical in material and shape. Splice connections at each end of the insertion member provide for load transfer to the original structure. Components must be replaced when their location or extent of damage makes repair impractical, when replacement is more economical than repair, or when the damaged part is relatively easy to replace. For example, replacing damaged castings, forgings, hinges, and small structural members, when available, is more practical than repairing them. Some highly stressed members must be replaced because repair would not restore an adequate margin of safety.